Situated on the easternmost part of Visayas, Samar Island is the third biggest island in the Philippines. Although widely known for its array of spelunking sites, Samar also has many swimming destinations and other unusually beautiful scenic spots. 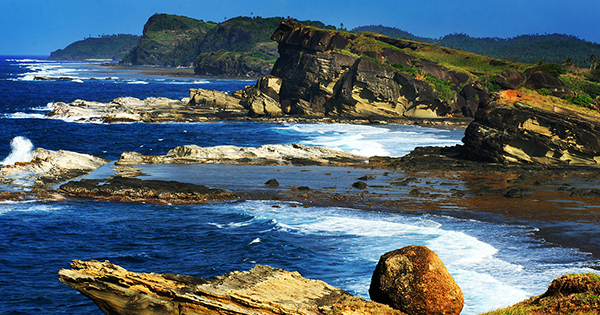 #1 - Biri Island: Situated at the end of Northern Samar, the most amazing rock formations in the country can be captured by your lens there, to your heart’s delight. This island is so captivating that the Philippine government announced it as a protected seascape and landscape locale in the year 2000. You can go there by airplane via Catarman National Airport in Northern Samar, which is just a one hour trip from Manila. Upon landing, go next to Lavezares town where you can rent a boat that would bring you to Biri Island in just 20 minutes. #2 - Sohoton Caves: These are some of the most famous caves in Samar, making it the Caving Center of the Philippines. You’ll discover why as you take a two-hour ride from Basey Town. Sohoton Caves are part of an 840-hectare park, which is blessed with limestone walls, a natural rock bridge, underground rivers, spectacular greeneries, and these breathtaking and huge caves. Enjoy a whole-day adventure with your buddies there by spelunking, kayaking, swimming and eating packed lunch at the caves. Sohoton Caves are truly a must-see for all its beauty; it’s even likened to Halong Bay in Vietnam. #3 - Lobo Cave: Highly recommended caving experience both for neophytes and experts, is an exciting day in Lobo Cave, which is located in Barangay Tagbayaon. Visitors are raving about Jose Abesamis Bonifacio of Trexplore Adventure, who lives in Catbalogan City; he can provide a great guide for those willing to explore Lobo Cave, especially its underground rivers, canyons, stalactites, stalagmites, mud hills, underground falls, etc. Get loads of fun doing a rope descent, frolicking in the mud, swimming, and riding a boat to cap off your adventure at this masterpiece of nature. #4 - Lulugayan Falls: Lulugayan Falls can be found in the peaceful town of Barangay Literon, in Calbiga, Western Samar. Also known as “Mini Niagara”, this majestic falls is awesomely wide - the water cascades, and then flows into the Calbiga River. You can get there via a motorbike ride, called “habal-habal”; a bit of a bumpy journey, we must say; however, this one hour trip, plus a mere 20-30 minutes trek towards the site, are sure worth all your effort, as you behold such a stunning natural body of water… so inviting the way it is positioned amongst very tall trees, reaching about a hundred feet, with the sweet chirping of birds and the sight of colorful butterflies playfully flying around, as if to welcome and appreciate you for visiting, to do some refreshing swimming and lots of picture-taking. #6 - Calbiga Caves: Better known as Langun – Gobingob Caves, located in Calbiga, Samar, these got recognized as the biggest cave in Southeast Asia and the second largest cathedral cave in the world. It spans a length of 6 kilometers, actually, and so you will need to file at least 3 days of leave from work to be able to maximize your spelunking in this one-of-a kind cave. The main cave is called Langun, which is so huge, that 3 football fields can fit it there, or an airport with 50 airplanes parked side by side. The most popular sightings in Calbiga Caves are speleothems, some rare species of bat and true tronglobionts such as cave crickets and eyeless fish. Truly every caver’s wish! #7 - Divinubo Island: Very near the coast of Borongan, Divinubo Island is such a divine little place surrounded by white-sand beaches and some wonderful surf areas. Furthermore, you can see a lighthouse there constructed by the Americans way back in the 19th century. Indeed, you will have a spectacular time having a picnic in this superb island, or doing snorkeling, kayaking, caving, singing at their karaoke place, or be captivated by gazing at the magnificent horizon during sunrise or sunset. You can reach this delightful island by taking a tricycle to barangay Lalawigan, and riding a boat from there. Otherwise, if the tide is low, you may just leisurely stroll across from Lalawigan, and voila! You would be in Divinubo Island. #8 - Malajog Beach: Treat yourself for some nice swimming time at Malajog Beach, located in Calbayog City. The sand may be black, but then, you will surely have lots of happy memories there with your family or friends, as you have your lunch together at the cottages for rent, and be able to buy some food or drink items at the small store in this relaxing beach. As one of the most famous and excellent beaches of Samar Island, Malajog Beach is just a 35-minute ride from the city proper, and is also known as Look Beach. What an interesting adventure within your reach!